For Mystery Science Theater 3000, 2017 was, in a word, huge. In April, the movie-riffing show awoke from an 18-year hibernation, carving up 14 fresh cinematic turkeys for Netflix and opening up a whole new comedic universe of crab hats, talking chimps, and hyperlocal monster myths. That was followed by a North American live tour, a six-day Twitch marathon, and a Comic-Con appearance where the show’s cast and creator submitted to the questions of some schmo who grew up watching MST3K in his very own Deep 13—and they didn’t even seem to mind when he bungled his question about season 11’s meta-reboot running gag. (Former cast members and writers are once again being financially compensated for their contributions to the show, and that’s good news, too.) Now, on the eve of the release of what is probably, almost definitely the final set of new-to-DVD episodes from Mystery Science Theater’s original run, Shout! 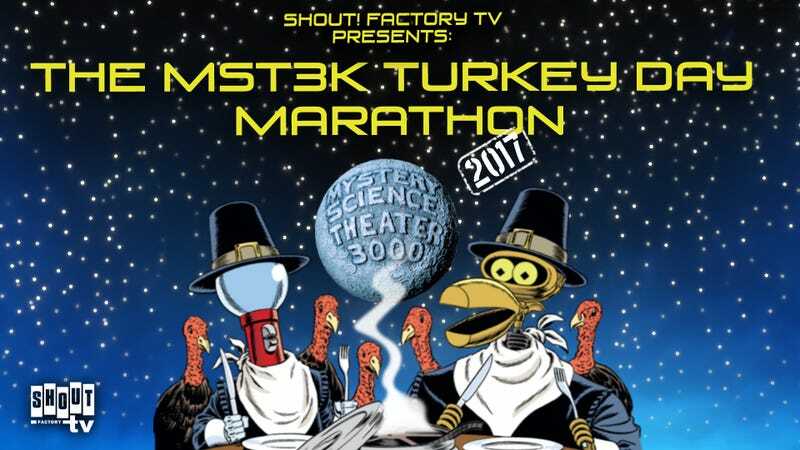 Factory announces the only appropriate capper to this amazing, colossal year: A Turkey Day Marathon. The A.V. Club is the first to report that creator Joel Hodgson and stars Jonah Ray and Felicia Day are set to roll out a Thanksgiving parade of classic MST3K on Thursday, November 23. Beginning at noon ET/9 a.m. PT, the marathon will stream at shoutfactorytv.com and on the Shout Factory TV app, featuring six episodes never before seen during Shout!’s now-annual celebration of the quest to find (and, ultimately, improve) the worst movies ever made. For those keeping score at home, that rules out Space Mutiny, I Accuse My Parents, Werewolf, Cave Dwellers, The Final Sacrifice, Mitchell, The Magic Voyage Of Sinbad, The Giant Spider Invasion, Lost Continent, Laserblast, Pod People, The Pumaman, Outlaw, Eegah, Gorgo, Teenagers From Outer Space, Danger!! Death Ray, Santa Claus Conquers The Martians, and Manos: The Hands Of Fate—so, you know, only a 100 or so other experiments to choose from. Maybe this is finally Riding With Death’s year? Doesn’t Turkey Volume Guessing Man deserve to be included in this celebration just as much as anyone else?